This photo essay centers on the Schwab Wholesale Produce Building that's located in the community of Tall Timbers on my C&TT RR. 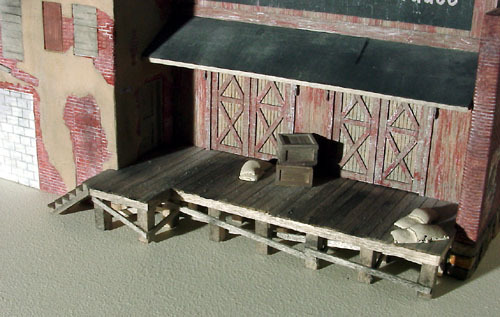 The plaster kit was originally created as an, "O," model by Roger Malinowski. 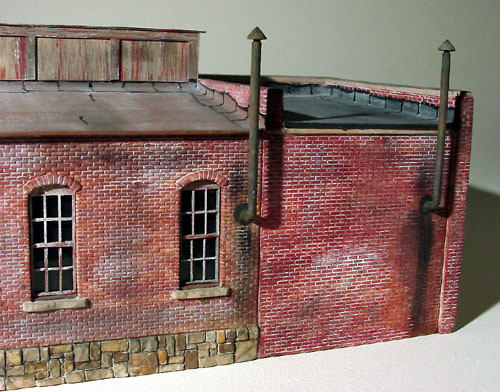 The S scale version was produced and released by Banta Model Works as its, "Grandview Storage," kit. 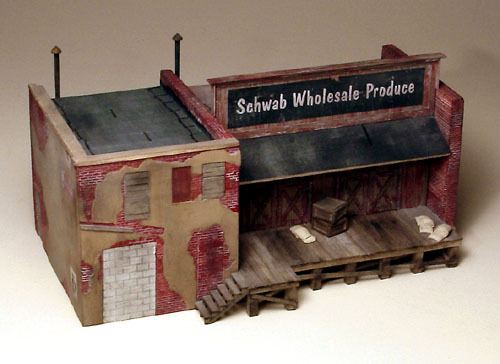 The building on my layout is named in honor of fellow Sn3 modeler, Mike Schwab. This first picture shows the front side of the structure. 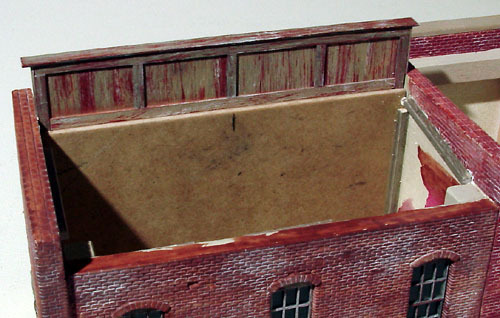 The kit is mostly plaster, but the wall for the loading dock is built up from laser cut wood pieces. 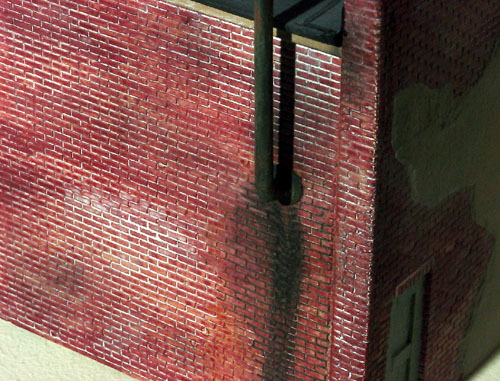 The rear wall for both buildings is one casting, with an inner wall between them. After the walls were cemented together with white glue and reinforced with inner corner blocks, the entire structure was sprayed, inside and out, with Krylon's satin finish, "Almond Satin". Folk Art liquid craft paints were used on the stones, bricks, doors and other plaster details which were cast into the wall components. Rather than cut out the thin "plaster flash" that covered the window spaces, I reinforced the inner wall with a piece of 1/8" thick Masonite. 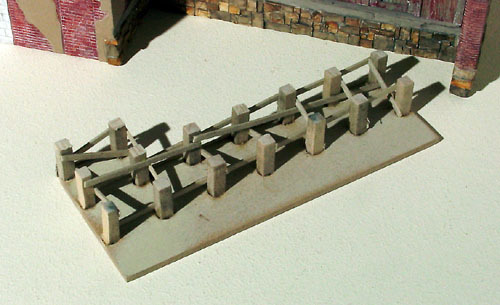 Masonite was also used as a support piece for the shipping dock wall. The wall components were attached to the Masonite and the whole assembly was glued in position with yellow carpenter's glue. Instead of building up a framework of dock supports and cross members, I used a technique I employed on the Brown & Segner Building. A piece of the Masonite was marked and drilled for the supporting posts. The posts were then glued into place from below. When they were firmly seated in position, diagonal bracing was added. Once the dock was glued in place, pieces of 2" x 10" strip wood was cut and glued to the Masonite. The decking has been added, stained with the alcohol and shoe dye mixture and furthered weathered with artist chalks applied with a make up brush. 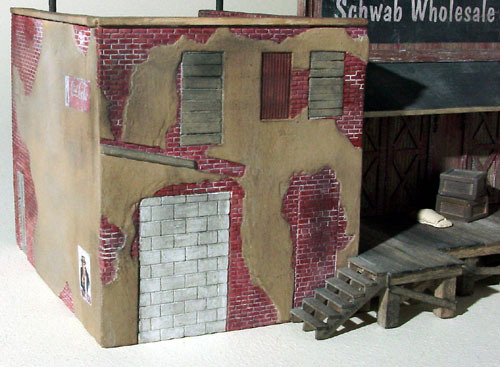 I altered the shape of the loading dock from the original kit design to place a set of stairs along the left side. Before the laser cut windows were installed, I painted the thick flash of plaster black. 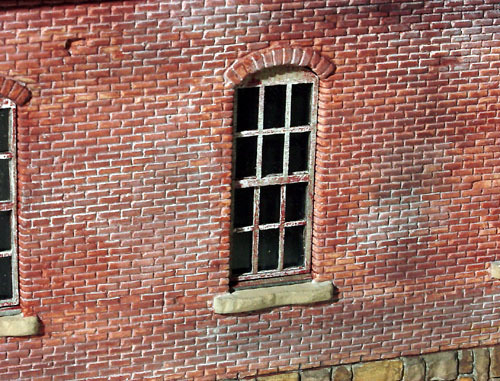 The windows frames were painted and weathered before the acetate glazing was attached. 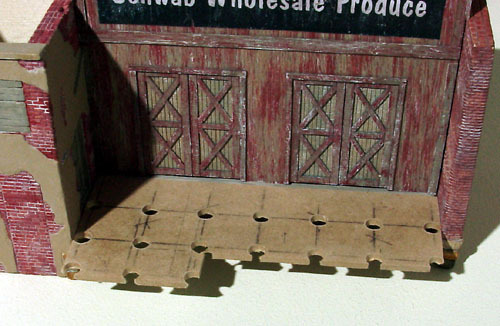 They were then assembled and glued into position with small dots of 5-Minute Epoxy. There was a slight gap between the base of the window sashes and the plaster sill. I filled it with a thin scrap of strip wood. 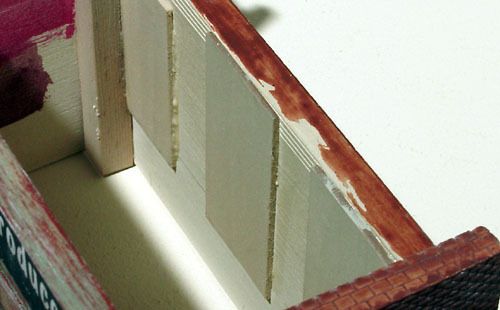 One of the techniques I use on plaster buildings is to fill in the corner joints or seams, if necessary, with plaster and carve in interlocking blocks or bricks. In this case, the joint was mostly hidden by the stucco material. Only a few bricks had to be carved into the added plaster. 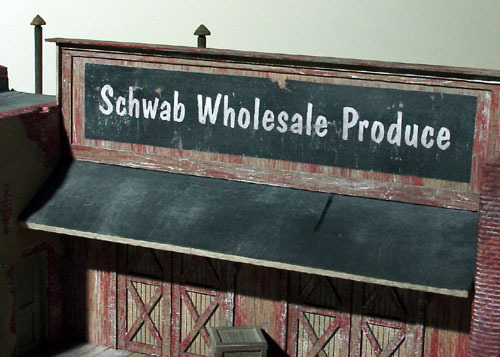 The "Schwab Wholesale Produce" sign was created with Adobe Photoshop LE and printed out to size with my ink jet printer on matte finished paper. I sprayed the printed area with Krylon Matte Fixative to prevent the ink from running in the next step. After the sign was cut from the paper, I placed it face down and carefully applied small amounts of water and removed the paper backing until I reached the back side of the ink. The thinned down sign was then attached to the front wall with white glue. I cut the roofing pieces to size, penciled in the shingle alignment lines and glued on 3' wide tissue strips with white glue. 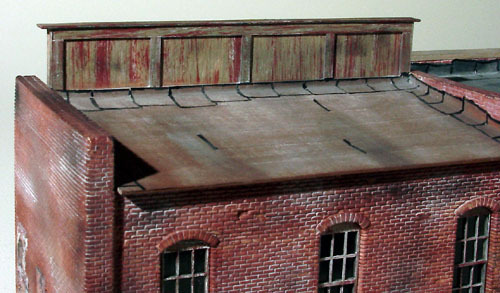 The shingled panels were then glued in place, resting on some stripwood supports that I attached to the inner walls. 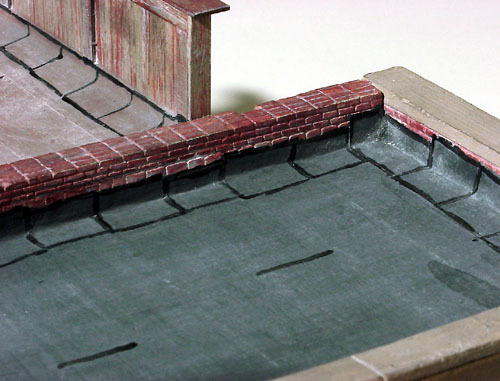 Additional shingle pieces were glued in place to represent the watertight seal between the roof and walls. Once they were painted their basic color, tar lines were added with Practa glossy black paint. Two holes were drilled through the back wall for the stove pipes. Prior to attaching them with 5-Minute Epoxy, I cut two disks from paper and slid them over the pipe to represent flashing. Once the Epoxy had set up, I weathered the pipes with dry brushings of paint and liberal amounts of my rusting solution which began life as "Sweet & Sour" weathering solution about 15 or 20 years ago, but now it's almost pure liquid rust. 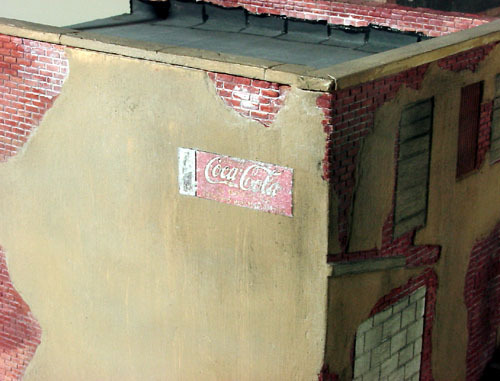 Additional weathering was created with dustings of black powered chalks, applied with the make up brush. The posters were thinned the same way as the main building sign. 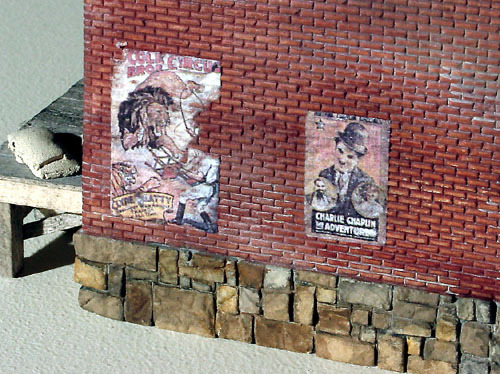 Some were torn, but applied anyway to represent posters that have served their time. Dustings of the artist chalks were used to further weather the brick walls. The wall of one of the buildings illustrates the various materials that were used to plug old window openings. All these details are carved into the plaster wall pieces and were colored with various shades of the acrylic paints. The final photo shows the completed structure with a few items of merchandise on the dock as it sits in the community of Tall Timbers. Mr. Schwab, on the right in the tan coat, is seen talking to one of his delivery men as they begin their day. 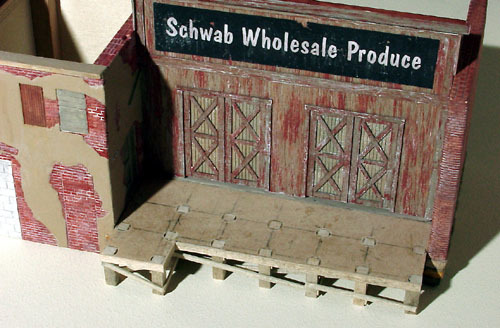 I hope you have enjoyed this brief description of my Schwab Wholesale Produce building as much as I did building it. 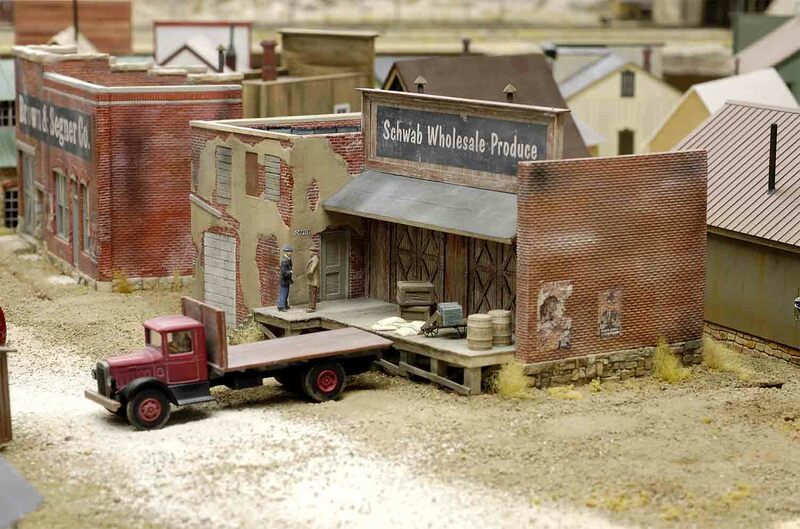 It's a welcome addition to the layout and continues to show that the town is growing and prospering.